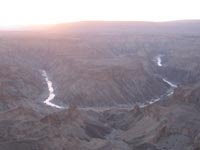 We proceeded across the border into Namibia and spent a night at the Fish River Canyon Viewpoint in our tents. Honestly we barely got to do more here than actually see the sunset over the Canyon. Canyon's don't really fascinate me much. Although that said I'd still really like to see The Grand Canyon in America. The next morning we headed to our campsite near Aus, which overlooked the Restricted Area. for those of you who don't know, Namibia is mostly desert (I bet the tabloids didn't mention it when reporting on Brangelina's Baby Birth!). Part of the desert falls into a diamond-rich restricted area, called the Skeleton Coast. 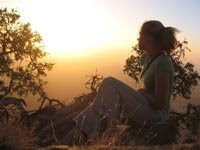 It's beautiful and on our first evening there we all took a walk up the hill next to our campsite to enjoy the sunset & view. 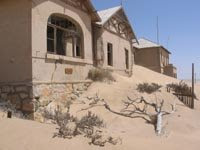 The two night's spent tenting there gave us an opportunity to visit nearby Luderitz, Kolmannskuppe (the highly photogenic ghost town between Aus & Luderitz and of great fascination to me! I'd love to go back here) and spot the Namibian Wild Horses (we only saw one or two, but the history behind them is interesting). 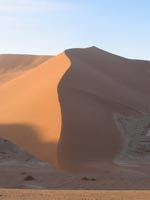 The next day we set off to Sesriem which serves as the perfect stop-over point to Sossusvlei and the opportunity to climb Dune 45 before sunrise. The climb was exhausting but the view from the top was well worth it. That photo is of the actual dune we climbed! We also had a chance to wander thru the Sesriem Canyon, which I preferred to the Fish River Canyon. Mostly because you could easily see the layers of rock differentiating when the river had been flowing faster or slower as it carved it's way thru the rock. After all our days spent in the sands of the Namibian desert, we headed into town, Swakopmund. Here I was lucky enough to try quad-biking for the first time and I went on a Dolphin Cruise - although we saw very few dolphins, but did get a visit from the trained seals who jump on board and allow you to feel their dry under-fur. 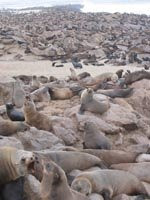 After a brief detour via The Cape Cross Seal Colony (a colony of bad laughs, if you ask me! ), we headed north to Ojitotongwe Cheetah Farm. This was a fantastic day. We started out driving thru the fenced Cheetah areas, seeing their more wild animals and watching them being fed, an amazing site as they fight each other for the giant chunks of meat thrown to them. They may not have to hunt to kill, but they certainly have to fight for their meal! 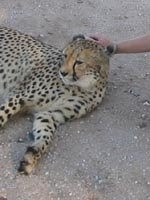 After that we went back to the main house and got to pet the 5 "tame" Cheetah's (yes, that's my arm in the picture!). One even stole my slip-slop but luckily the owner got it back for me :) An incredible experience. After our brief wild animal experience at the Cheetah Farm, we headed to the Etosha National Park. Here my most amazing animal sighting (and let's remember that I live in Africa, so merely seeing animals in the wild is just not enough to crack it to the top 10 list!) 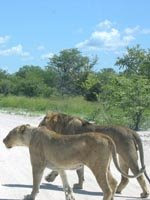 was watching two lions mating (that's them in the picture, crossing the road in front of our van just after they'd finished). It was an amazing experience and I'd think fairly rare. Especially since we were the only van (thanks to our guide who spotted the tell-tale signs) that stuck around and waited and were there when they got to it again. Lion's tend to mate every 20 minutes for 3 to 4 days. Essentially it was just a matter of time so we waited patiently and were privileged to watch the (very short) show ... as per the timestamp on my photos, it lasted less than a minute and the lioness howled thruout!